Period locking allows you to protect your accounting data to prevent accidental or unexpected changes. Period Locking is commonly used when records up to a particular point in time have been verified, such as the end of the fiscal year. A user can lock the data to ensure that the records won't change for all dates up to and including the end of fiscal year date. 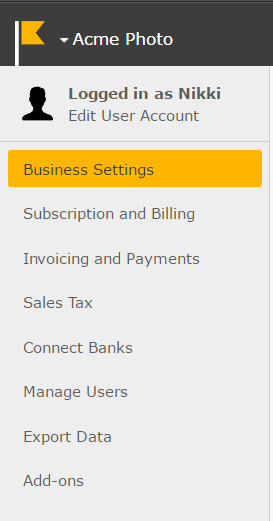 Next, click on the checkbox next to Period Locking. You will then see a Locked Period End Date field appear. 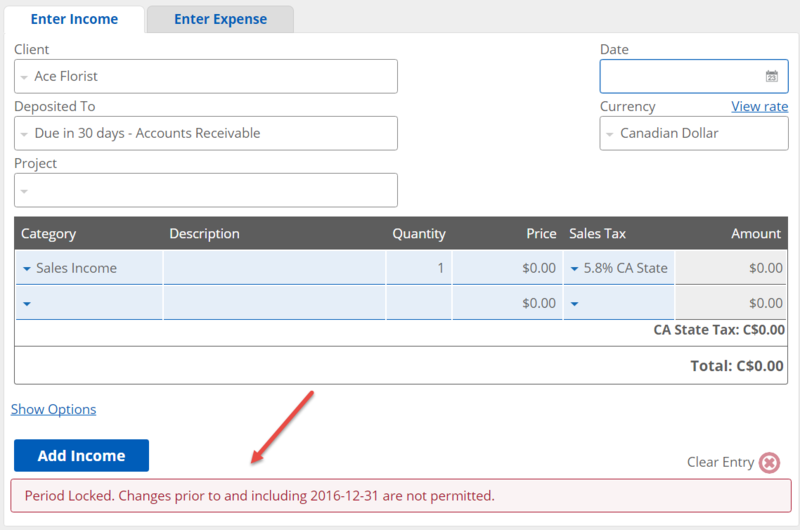 Simply enter the end date of the period you want to lock your records up until. In the example of a company having a fiscal year end date of December 31, 2016, they would enter that date as the Locked Period End Date to make sure all records up to and including December 31, 2016 cannot be added, edited, or removed. Make sure to click on Save Settings after entering the Locked Period End Date. Once your period lock end date has been set up, you will receive an error message if you to try to add, edit, or remove a record up to and including that date. For example, this is an error message that occurs when you attempt to add a new income record in the locked period. Likewise, an error message will pop up when you try to remove or edit a record within the locked period. Next, uncheck the checkbox next to Period Locking. Then click on Save Settings. If you just need to make changes in a specific month then you can update the date that you have locked your account until, add or edit the necessary transactions, and then change the locked period as needed. Make sure to click Save Settings after each change to the period locking.